The PSE&G Solar Loan program is designed to help homeowners buy their solar system at a substantial discount. It is open only to PSE&G customer and is available a few times during the year. You can purchase your solar system at a whopping 70% discount with this program. PSEG gives you a loan for 40% of the systems cost. However, this is not an ordinary loan: there are no monthly payments to be made. PSE&G accepts your Solar Renewable Energy Credits (SREC's) in lieu of monthly payments. You don't have to pay a penny for the loan. In addition, you get 30% of your solar systems cost back from the federal government as a tax refund. This is the 30% federal tax credit. 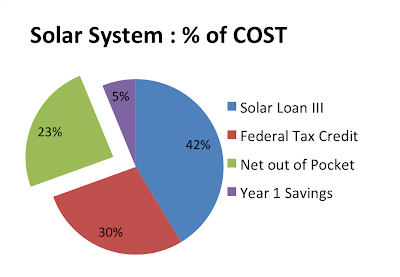 The 40% from PSEG and the 30% from the federal government adds up to 70% of your solar systems cost. You net out of pocket is just 30%. The loan approval is based on a competitive bidding process and Ampericon's track record is a 100% approval for all applicants. Look for the dates for the next round of the solar loan program on the PSEG website. PSEG usually opens solar loan once every 3 months, so you can avail of this offer year round. If you have any questions or would like to be guided through the process, just give us a call at 609 945 2591 or email jon@ampericon.com or visit our website. We will be happy to bring you closer to your solar system and the freedom from paying for electricity.